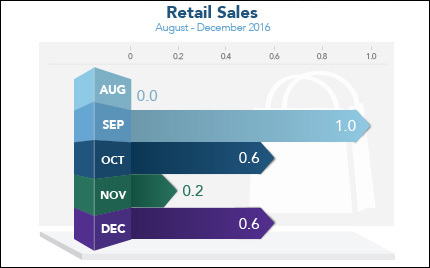 Last Week in Review: Retail Sales rebounded in December after a disappointing November. Forecast for the Week: Consumer inflation is an important data point to watch. Plus, look for news on housing and manufacturing. View: Meet your personal assistant: Alexa. “Hey big spender. Spend a little time with me.” Shirley Bassey. Consumers spent more time ringing up sales in December. The Commerce Department reported that Retail Sales rose 0.6 percent in December from November. The increase was due in part to strong sales for autos. The year ended with momentum that could signal sales growth in 2017. From December 2015, sales were up 4.1 percent year over year. Overall, sales were up 3.3 percent for 2016 after a 2.3 percent gain in 2015. Meanwhile, wholesale inflation ticked up in December, increasing 0.3 percent from November, as reported in the Producer Price Index (PPI) from the U.S. Bureau of Labor Statistics. From December 2015 to December 2016, PPI climbed 1.6 percent, which was the largest 12-month gain since 2014. Core PPI, which strips out volatile food and energy prices, also increased 0.2 percent from November to December. Inflation, at both the wholesale and consumer levels, is an important measure to track because increasing inflation reduces the value of fixed investments like Mortgage Bonds. When Bond prices worsen, the home loan rates tied to them can worsen as well. Although Bond prices and home loan rates took a hit recently following economic news releases, home loan rates are still near historic lows. The Consumer Price Index is a key report to watch in a week that kicks off Tuesday with a full slate of manufacturing, housing and other data. Markets are closed Monday, January 16 in recognition of Martin Luther King Jr. Day. Regional manufacturing data will be released in the Empire State Index on Tuesday followed by the Philadelphia Fed Index on Thursday. Wednesday brings the closely watched Consumer Price Index along with the Fed’s Beige Book. Look for housing data via the NAHB Housing Market Index on Wednesday and Housing Starts and Building Permits on Thursday. As you can see in the chart below, Mortgage Bonds recently lost some of the footing gained heading into 2017. Google Home knocks. After two years on the market, Alexa may finally have some serious competition. Like Amazon’s line of products, Google Home ($130) can look up information, stream music through speakers comparable to the Echo’s and perform other tasks. The virtual assistant inside Google Home’s 5.6-inch-tall speaker — it answers to the command “Okay Google” — will seem familiar to many Android smartphone users. And Google Home devices can communicate with one another, so you can have multiple speakers around the house playing the same music. Expect Google Home to work with many popular apps and devices, including Chromecast, Google Calendar, Nest learning thermostats and Spotify.